Pairs of rabbits are on display in cages at Riverton High School for the first Rabbit Breeders Convention. Rabbit: the other other white meat. Or perhaps red. 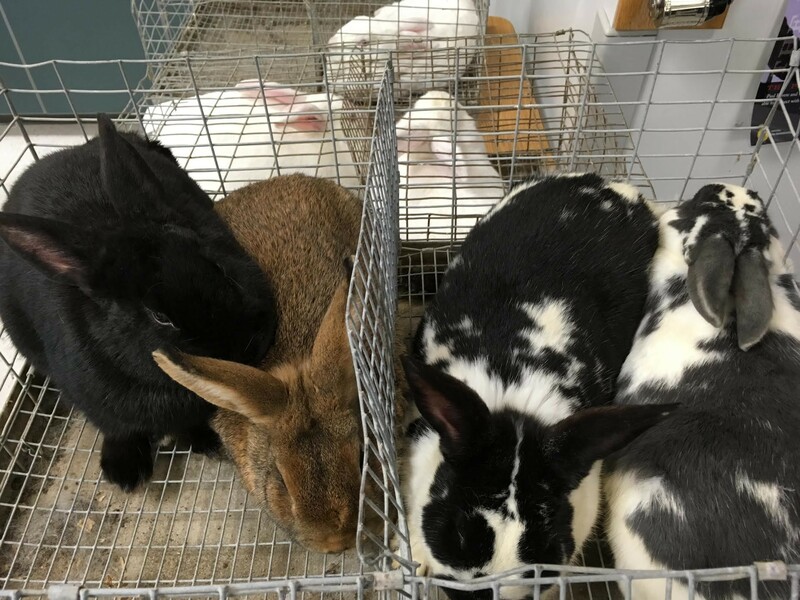 Inside a classroom at Riverton High School, two adults are talking about whether rabbit meat is red or white as they peer into wire cages where pairs of rabbits wiggle their noses, smelling scents imperceptible to the humans around them. It was the first Rabbit Breeders Convention, held last Saturday, where more than 80 participants gathered to learn about raising rabbits as livestock. If you've paid any attention to food production and farmers markets, it's clear that a preference for local ingredients has burgeoned, and some growers are making a case that rabbit meat is a sustainable, efficient and under-appreciated protein option. "It's high in protein. It's lean—low in fat, lower in calories than the other meats. Health-food people call it a 'power food,'" says Steve Jensen, a middle-aged rabbit breeder from Herriman who organized the event with help from Utah State University. Jensen's parents have been cooking rabbit meat since the 1970s (definitely a white meat, they say. Later, however, a lecturer says rabbit can be categorized as a red meat for inspections.) He and his family run Lapin Farms and have become experts in the industry. Rabbits are cute and cuddly, rabbit breeders agree, so it's challenging for some people to get over the image of Peter Cottontail in their casserole. But once they do, they're in for a treat, the breeders contend. "Chicken tastes a lot like rabbit," Jensen affirms. But don't snack on the roadkill or bunny your uncle shot among the sagebrush just yet—it might be infected with trichinosis. After a lunch break, Noel McSpadden, a meat inspector, gave a lecture on state regulations that govern rabbit slaughter. "We ensure that it's properly labeled, unadulterated and passed all the inspections," he says. Vernon Parent is a Utah State University extension associate professor, who is familiar with livestock trends. "A lot of populations nowadays are getting more into the DIY thing. They're raising their own chickens, and they're raising their own rabbits—not as a pet, but as meat," he says. "And pound for pound you can raise more meat in rabbits for feed given than you can for beef. It's a more efficient animal." With one male and two females (known as bucks and does), breeders can yield 180 pounds of meat in a year. In the last few years, articles about America's growing appetite for rabbit meat have appeared in a range of publications, including The Atlantic and huffingtonpost.com. A post on livestrong.com, a site which focuses on health, nutrition and positive living, breaks down the nutritional value in rabbit. "Rabbit meat is relatively low in fat; each 3-ounce serving has 6.8 grams of fat, which accounts for 37 percent of the calories," states health author Nicki Wolf. "Compared to beef and pork, rabbit is the clear choice—3 ounces of beef has 18.3 grams, and 3 ounces of port has 8.2 grams." A serving of rabbit can satisfy almost half of a person's daily protein (about 25 grams of a recommended 56 grams, depending on gender and weight), it offers a punch of vitamin B-12, and rabbit contains an antioxidant-producing mineral called selenium, Wolf goes on to explain. In the city, diners can order rabbit in a few restaurants, such as Avenues Bistro on 3rd (rabbit pot pie) and Provisions (pappardelle with braised rabbit). Not everyone is thrilled about the rabbit breeding movement, however. A national rabbit advocacy organization called the House Rabbit Society recognizes rabbits for their intrinsic value, and the group isn't too timid to jump into a political battle—last year, for example, HRS petitioned California to pass a law that banned pet stores from selling non-rescue cats, dogs and rabbits. House Rabbit Society did not respond to City Weekly's request for comment on rabbit meat, but the organization addresses the topic on its website. "HRS members and volunteers live and share our lives with rabbits, and know what incredible creatures they are: intelligent, curious, willful, funny, affectionate, greedy and even destructive. So to think that millions of our cherished rabbits are being raised and slaughtered in factory-like conditions, with very little government oversight, for human consumption every year is highly disturbing," it states. For the last five years, Kevin Jenson has raised rabbits in the Uinta Basin. It's been a hard row, he says. And so, he attended Saturday's conference to learn how he could improve his operation. Feeding rabbits has posed a costly challenge. Jenson has about 60 does, but he's hoping to scale up his production. A few years ago, he says, he built a mobile pen without a floor. His idea was to herd his rabbits into the pen, and let them eat his lawn. Every day or so, he would relocate the cage on top of a new patch of grass. "That worked real well for a couple of days," he says. "Then they started to dig." One morning, he went to his yard to find a hole so deep that he couldn't reach his arm to the bottom. With that experience in mind, Jenson signed up to attend a class on rabbit pens. The convention also offered courses on recipes, breeding cycles and the difference between pets and livestock. Bottomline, convention organizer Jensen says, "We're helping people get into rabbits."